ABSTRACT: Purpose of present research work was to develop mouth dissolving tablets of loperamide using superdisintegrants. Mouth dissolving tablets of loperamide were prepared by direct-compression method after incorporating superdisintegrants Ac-Di-Sol, Sodium Starch Glycolate (SSG), and Crosspovidone in different concentrations. Effect of superdisintegrants on disintegration and dissolution behavior of tablet in O.1 N HCl, phosphate buffer (pH 6.8) was evaluated. 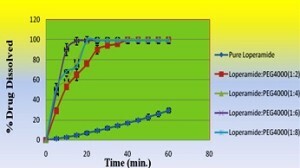 To address poor solubility of loperamide, solid dispersion using solvent evaporation techniques was prepared using hydrophilic carrier PEG4000, PVP K-30, and Urea. Improvement in dissolution of drug was observed in solid dispersion as compared to pure drug. The 100% drug release was obtained from the solid dispersion (prepared by solvent evaporation method) of Loperamide: PEG4000 (1:6) in 10 minute. Formulations were evaluated for Weight variation, hardness, and thickness, friability, wetting time uniformity of dispersion, drug content, disintegration time and in vitro dissolution studies. The drug content of all the formulations was within the acceptable limits of the United States Pharmacopoeia XXVII. Optimized formulation showed good release profile with maximum drug being released at all-time intervals. Optimized Formulation (F-8) containing crosspovidone showed > 90% drug release in 20 min and disintegration time of 17 sec. From Stability point of view no appreciable change was observed in release profile and drug content after 3 month storage of tablet at 40±2º and 75±5% RH. INTRODUCTION: Loperamide 4-[4-(4-chloro phenyl)-4-hydroxypiperidin-1-yl]-N, N-dimethyl-2, 2-diphenylbutanamide is a poorly water soluble drug used in the treatment of diarrhoea (solubility <1 mg/100 ml). It is commercially available as a hydrochloride salt under the trade name Imodium in order to overcome the problem of poor solubility and hence poor oral bioavailability 1. (c) of transforming the drug from the crystalline to the (partially) amorphous state. Mouth dissolving dosage forms has solved some of the problems encountered in administration of drugs to the pediatric and elderly patient, which constitutes a large proportion of the world's population. Hence, patient demand and the availability of various technologies have increased the market share of Mouth dissolving tablets, which in turn prolongs the patent life of a drug. Keeping in view of the advantages of the delivery system, rapidly disintegrating dosage forms have been successfully commercialized, and because of increased patient demand, these dosage forms are expected to become more popular 2, 3. MATERIAL AND METHODS: Loperamide was procured from Well cure pharma Indore (M.P.) India. Urea, PEG-4000 and PVP K-30 were of pharmaceutical greade and obtained commercially. Ac-di-sol, Crospovidone, Avicel pH 102 was procured from Lupin Research Center pune (M.H.). India. Aspartame, Mannitol SD-200 DC (perlitol) procured from Plethico pharmaceuticals Ltd. Indore (M.P.). Talc, Magnesium Stearate was purchased from Loba Chemie Pvt. Ltd. Mumbai. All solvent used were of analytical greade and were purchased from Merck Ltd. Mumbai (M.H.) India. Solvent evaporation method: Loperamide, PEG-4000 PVP-K-30 and Urea were weighed accurately in the ratio of 1:1, 1:3 and 1:5 and triturated in a mortar pestle for 5 minutes and dissolved in 50 ml of methanol with constant stirring. The solvent was evaporated at 45ºC and dried in a desicator for 12 hrs and passed through sieve No. 60 4. Preparation of Physical mixtures: Loperamide was taken with PEG 4000, PVP K-30 and Urea, in the ratio of 1:1, 1:3 and 1:5 and triturated in a mortar and pestle for 15 minutes and kept in a dessicator for further use 5. Solubility study of various type of solid dispersion:The solubility studies were performed by taking 10 mg drug equivalent of solid dispersion from the each batch (SD-A, SD-B and SD-C) were dissolved in water and PBS (pH6.8) and kept in mechanical shaker for 30 min at 30ºc. Sample was taken after 30 min from each volumetric flask and was analyzed spectrophotometerically at 259 nm 6. The solubility studies were performed by taking 10 mg drug equivalent of physical mixture from the each batches (PM-A, PM-B and PM-C) and dissolved in water and PBS (pH6.8) kept in mechanical shaker for 30 min at 30ºC. Samples were taken after 30 min from each volumetric flask and absorbance were measured by UV-visible spectrophotometer 7. Characterization of Solid Dispersion: The drug and the prepared solid dispersions were evaluated for drug content,thin layer chromatography, FTIR Spectroscopy, In-vitro dissolution studies. Drug content: Accurately weighed quantity of solid dispersion, equivalent to 10 mg loperamide was dissolved in 10 ml of methanol by using mechanical shaker for 30 min. and filtered using whatman filter paper and absorbance was measured at 259 nm by UV-visible spectrophotometer 8. Thin Layer Chromatography: Solid dispersions were subjected to TLC using pure Loperamide as a reference sample. The solvent system for TLC of Loperamide was chloroform, methanol, and formic acid (25.5: 3: 1.5). The Rf value of pure drug Loperamide and its Solid dispersion wear calculated. FTIR of Solid Dispersion: FTIR spectrum of solid dispersion was taken from solid powder material and compared with pure loperamide spectrum. In-vitro dissolution studies: Dissolution studies were conducted using a type II (paddle) USP dissolution apparatus with 900 ml PBS 6.8 pH as dissolution media. The temperature of the medium was maintained at 37°c ± 0.5 and RPM set as 50. The drug was assayed spectrophotometrically at 259 nm 6. Formulations of mouth dissolve tablets for loperamide: Drug Polymer complex (solid dispersion) and all Excipients were passed through sieve no 60. Drug polymer complex, directly compressible Mannitol, Superdisintegrants (Sodium starch glycolate, Croscarmellose Sodium or Crospovidone), Microcrystalline Cellulose PH 102, Aspartame, Vanilla flavor, Talc were mixed together for 20 min. Magnesium stearate, was then added and mixed for 5 min. Then blend of drug and Excipients to compress on Single punch machine Table 1 6. Evaluation of Mouth Dissolving Tablets: The Formulated mouth dissolving tablet were evaluated for different parameters like General characteristic, uniformity of weight, hardness, wetting time, Uniformity of dispersion, Disintegration test, Drug release study Table 2 8. General characteristic: General appearance of tablet, its visual identity size, shape, color of the tablet was evaluated. Uniformity of Weight: 20 tablets of each batch were collected randomly during compression and weight of individual tablets was carried out. Content of Active Ingredients: The amount of active ingredient was determined by the method described in the drug content. By crushing the 10 tablets and taking powder equivalent to 8 mg Loperamide. Then this powder dissolved in 100ml 0.1N HCl appropriate dilution of the resulting solution was prepared and absorbances of the resulting solution were taken UV Spectrophotometrically. % drug content has been calculated. Wetting time: Five circular tissue papers of 10 cm diameter are placed in a Petri dish with a 10 cm diameter. Ten millimeters of water-containing methyl red, a water-soluble dye, is added to Petri dish. A tablet is carefully placed on the surface of the tissue paper. The time required for water to reach upper surface of the tablet is noted as a wetting time 10. Disintegration test: Apparatus for Disintegration of Tablets and Capsules according to Indian pharmacopoeia 1996 used for the determination of disintegration test for dispersible tablets. The beakers containing the 900ml distilled water at 25 ±1˚C and operate the apparatus for three min. and remove the assembly from the liquid. The tablets pass the test if all of them have disintegrated. Dispersible tablets should disintegrate within 3 minutes when examined by the disintegration testaccording to Indian Pharmacopoeia 1996. Uniformity of Dispersion: This test is applicable only to Dispersible Tablets. Place 2 tablets in 100 ml of waterand stir gently until completely dispersed. A smooth dispersion is obtained which passes through a sieve screen with a nominal mesh aperture of 710 µm (sieve number 22). Drug release study in simulated salivary fluid pH 6.8 & 0.1 N HCl: The drug release method for mouth dissolving tablets is comparable to the approach to the approach taken for conventional tablets, and is practically identical. The release study carried out in USP Type 2 dissolution apparatus containing 900ml 6.8 pH phosphate buffer and 0.1 N Hcl at 50 rpm and 37oC temperature. The drug release sample 5ml withdrawal by suitable time interval and fresh dissolution medium were added in the each withdrawal. Then appropriate dilution of the samples has been prepared and absorbances of the resulting solution were taken spectrophotometrically 11. Stability study:Stability study was conducted by storing the tablets at 40±2º/75±5% Relative humidity for three months. The content, hardness, weight variation and release behavior from dissolving tablets were tested after three month (ICH guidelines). RESULTS AND DISCUSSIONS: Prepare solid dispersion and physical mixture ratio 1:1, 1:3, 1:5 with PEG4000, PVP k-30 and urea optimize by best solid dispersion and physical mixture of solubility process with PBS and water. According to observations obtained the solubility of the SD-A (Drug-Peg4000) was found maximum it show that the drug was enhanced with increasing the quantity of peg4000 and observations obtained in the physical mixture no significant change seen in the solubility of drug as compared to pure drug in this study best result found in the drug-peg4000 complex solid dispersion this is select for final solid dispersion. For further study performed final solid dispersion prepare different ratio of solid dispersion ratio 1:2,1:4,1:6,1:8 according to observations obtained various media solubility of SD-III show maximum. Prepared solid dispersionsSD-2, SD-2, SD-3, and SD-4 evaluated for drug content 97.60%, 96.3, 98.90, 94.20 respectively. The TLC studies show clear resolution for solid dispersion system. RF value of loperamide, drug+peg4000 and drug+PVP K-30 is 1.43:1.38:1.46 respectively. The FTIR data was compared with the standard spectrum of loperamide and the characteristics peaks associated with specific structural characteristics and their presence in polymeric carrier as well as solid dispersion were noted. The drug showed major peaks at 1447cm-1 for C-O-H, 1375cm-1 for -CH3 ,1036 for R-Cl and peak 1622cm-1 for –C=O appears aliphatic ketone and peak between 770-735 cm-1 for characteristic aromatic hydrocarbon. Solid dispersion exhibited peaks of the drug and the carriers. The IR spectra(Fig 1) of solid dispersion PEG4000 complex exhibited characteristic drug peak 1622 cm-1 and 1375cm-1 broadening due to overlapping between solid dispersion of PEG 4000, -C-C- of the drug perhaps result in increased solubility. This indicates that solid dispersion spectra were only the summation of loperamide and PEG4000 spectra and it reflectes that there was no major interaction between loperamide and PEG4000. Solid dispersion of drug and PVP K-30 complex shows that 1375 cm-1 characteristic drug peak (-CH3) are negligible and broading of peak summation of loperamide and PVP K-30 (1652-1622cm-1) shows interaction between drug and PVP K-30 complex. There was major interaction between loperamide and PVP K-30. In IR spectrum drug-Urea complex solid dispersion, broading of aliphatic ketones peak 1622cm-1 is due to –NH group of urea that interacts with –CH3 group of loperamide. This indicates major interaction between loperamide and Urea. The FTIR spectra of solid dispersion drug- PEG-4000 (Fig 1) showed that there was no significant interaction between drug and carrier. In-vitro dissolution studies pure loperamide and different ratio of final solid dispersion according to drug contents (10mg drug containing) using type-II (paddle) USP dissolution apparatus with 900 ml PBS ph 6.8 at 37 ± 0.5 and rpm 50.the initial % drug dissolved in 1 hour loperamide slowest dissolution only 29.49% and SD-1,SD-2,SD-3 and SD-4 dissolve 99% in 45,30,25 and 25 respectively. Comparative % drug dissolution from solid dispersions in 25 min. 79.45%, 97.99%, 99.10% and 99.02% respectively. Mouth dissolving tablets of Loperamide were prepared by superdisintegrants addition method and evaluated for various evaluation parameters of the tablets. Total nine formulations were designed (table 1). The hardness of tablets from all formulations was in between 1.76 to 3.56 kg/cm2. All the formulations showed friability below 0.91%. All the tablets were found to pass the uniformity of weight (table 2). Content of Loperamide from all formulation was found in range of 94.09% to 97.15% (table 2). All the formulations tablets disintegrate in 15 to 22 S respectively (table 2). The wetting time was measured and found in range of 41.66 to 71.00 S (table 2). Superdisintegrants Polyplasdone XL (Crospovidone) batch no. LT –VIII displays best results among nine batch of the Mouth dissolving tablet. The in-vitro release study was carried out using 900 ml of 6.8 pH phosphate buffer and 0.1N HCl as dissolution medium at 50 rpm using USP dissolution apparatus. 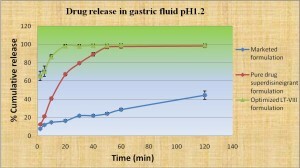 Formulation LT-VIII showed rapid dissolution and cumulative drug release at the end of 40 min. 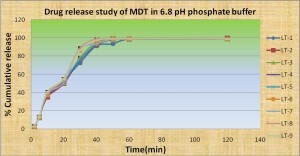 was more than 98% in 6.8pH phosphate buffer and in case of 0.1N Hcl, 99% drug release in 20 min (Fig. 3 & Fig. 4). In-vitro release profile of conventional marketed tablet and pure drug superdisintegrants formulation and optimized LT-VIII were performed. Solid dispersion formulation (Fig. 5). LT-VIII gave far better dissolution then the conventional marketed tablet. 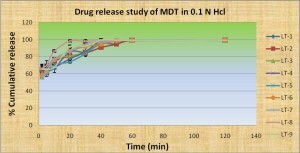 Conventional marketed tablet releases only 16.52% drug while pure drug superdisintegrants tablets releases 67.22% drug in 20 min and LT-VIII exhibited almost 99.02% drug release in 20 min. The present dissolution efficiencies of conventional market tablet, pure drug superdisintegrants tablet and LT-VIII. Tablets at 40 ± 2°C/75± 5 %RH for Three month, were tested for their contents, hardness, weight variation and release behavior. It was observed that content from the tablets shows no appreciable change (Fig. 6). CONCLUSION: It can be concluded that the improvement in the dissolution of the poorly water soluble drug Loperamide through solid dispersion of solvent evaporation, which was obtained stable powder that possessed superior bioavailability and suitable for geriatric population and erratic absorption profile. Solid dispersion system of Loperamide can be used to enhance the in-vitro dissolution rate and bioavailability, due to improvement in wettability and solubilisation effect by the hydrophilic carrier (PEG4000, PVP-K-30 and Urea) at dissolution site. Overall, the results suggest that suitably formulated mouth-dissolving tablets of Loperamide containing super disintegrants (croscarmellose sodium, sodium starch glycolate, crospovidone). The tablets exhibited good in-vitro disintegration and wetting properties in presence of Super-disintegrants. The present study demonstrate that mouth dissolving tablet using solid dispersion have enormous potentials for increasing dissolution and finally the bioavailability of the drug. ACKNOWLEDGEMENTS: Authors wish to acknowledge Lupin Research Center, Pune, India for providing Ac-di-sol, Crosspovidone, Avicel pH 102 as gift sample. Authors are grateful to well cure pharma Indore, India and Plethico Pharmaceuticals Ltd, Indore, India for provingLoperamide and Aspartame, Mannitol SD-200 DC (perlitol) respectively as gift sample. United States Pharmacopoeia, The official Compendia of standard USP 26/NF 21. Asian edition (2003), United States Pharmaceutical Convention Inc. 2488. Sharma S: New Generation of Tablet: Fast dissolving tablet. Latest reviews. Pharmainfo.net 2008: 6(1). Chaudhari PD, Kholhe S, Dave K and More DM: Formulation and Evaluation Fast Dissolving Tablets of Famotidine. 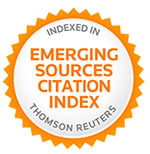 Indian Drug 2003: 44: 641-649. Nagasamy V, sangeetha S, Karthick S, Mohammed K, Fakruddin G, Vivek MK, Sankar S and Elango K: Solid Dispersions: A Unique Technique To Improve The Aqueous Solubility of Poorly Soluble Drugs - A Review. Int. J. Phar. Research 2008: 1 (1): 5-12. Pathak D, Dahiya S and Pathak K: Solid Dispersion of Meloxicam: Factorially Designed Dosage Form for Geriatric Population. Acta Pharm 2008: 58(14): 99-110. Modi A and Tayade P: Enhancement of Dissolution Profile by Solid Dispersion (Kneading) Technique, AAPS PharmSciTech 2006: 7:E1-E6. Martin A, Bustamante P and Chun AHC: Physical Pharmacy, Fourth Edition, B.I. Waverly Pvt. Ltd, New Delhi1996: 446-448. Indian Pharmacopoeia, New Delhi: Ministry of Health and Family welfare, Government of India, Controller of Publication 1996: 1312-1314. 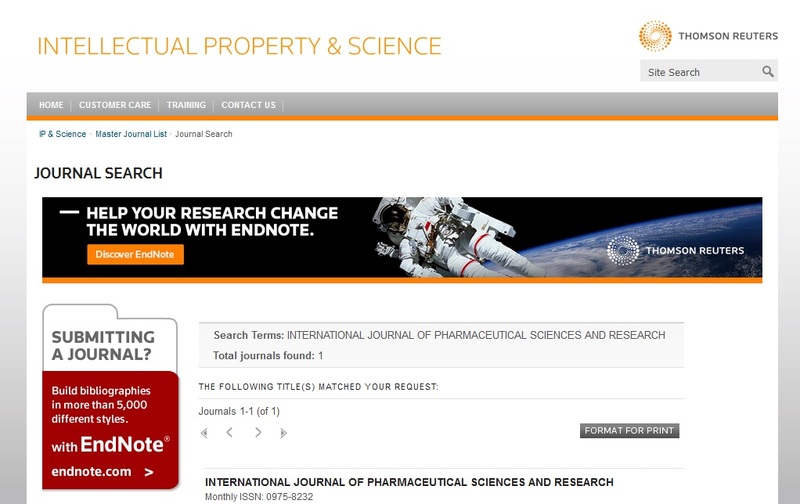 Lachman L, Libbirmann HA and Kanig JL: The Theory and Practice of Industrial Pharmacy Varghese Publishing House, 3rd edition1987: 329-336. Patel DM, Patel NM, Shah RR, Jogani PD and Balapatel A: I Studies in Formulation of Orodispersible Tablets of Rofecoxib. Indian J. of Pharm. Sci. 2004; 66: 621-625. Siewert M, Dressman J, Brown CK and Shah VP; FIP; AAPS.FIP/AAPS Guidelines To Dissolution/In Vitro Release Testing of Novel/Special Dosage Forms. AAPS. PharmSciTech. 2003; 4: 43-52.